Here is your step by step guide for teaching your children how to measure, chop, slice, flip, bake and much more. Let the fun begin. First you will want to introduce your child to washing, slicing, simple chopping, measuring, tasting and even improvising. Salad prepared with a homemade salad dressing is the perfect dish for new chefs. It is not hard to do, but it does have a number of tasks to do and it is an important part of the meal. For kids that are ready to go a bit further, making croutons from scratch will not only add a delicious crunch, but it will also introduce your little chef to working with heat. How do you teach salad making? Set up your work space. As you explain the importance of rinsing fruits and vegetables, set up your child at a clean sink or a large bowl filled half with cold water. If it is needed, have him stand on a sturdy chair or even a step stool. After swishing the herbs and lettuce for a bit, your child can put them in a salad spinner and whirl everything dry. Then tear everything into bit sized pieces. Have him rinse grapes and cucumbers in a small colander and pat them dry with a paper towel. Show him how to peel the cuke by dragging the peeler lengthwise from end to end. Always peel away from the body. Make sure you put the vegetable on a stable surface. Do not be tempted to hold it in the air. Peel away from your hands and always work directly in front of you. For cuke slicing, a wavy knife is the best bet. Let your child decide how thick or thin he wants the slices to be. Also, have him use a skid proof cutting board for a little extra added safety. Mixing the dressing and tossing the salad. Set up a little science lab where your child can learn to make salad dressing, first by using your recipe. Then he can move on to creating his own in future lessons. After he has added the dressing to the salad, he can practice his tossing skills with a pair of tongs. Be sure to explain that tossing means pulling the bottom leaves up to the top and not throwing the salad out of the bowl! Let him be the first to taste a leaf to test whether the salad has enough dressing. Cooking with your kids can be fun. Leave us your comments. Your feedback is greatly appreciated. Let us know what other topics you would like to have discussed. Share this post with your friends. Remember to always praise your child. Start the day with a bang! Baked granola cups filled with yogurt and fruit will give your kids energy for hours. Here is how to make it. Spray a muffin tin with cooking spray. In a big bowl, mix 3tbsp. melted unsalted butter, 1\4 cup of honey, 1 3\4 cups rolled oats, 1\8 tsp. salt, 1\4 tsp. cinnamon, 1\4 cup of unsweetened coconut flakes and 1\4 cup of flaxseed. Using wet fingers, Press the mixture into the muffin tin slots. Bake at 350 degrees until it is golden brown. It will take about 15 minutes. Let the muffin tin cool for about 15 minutes. Then use a spatula to remove the cups. Fill each cup with 1-2 tbsp. Greek yogurt and top with berries of your choice. Makes 8 granola cups. Leave us your comments. Your feedback is greatly appreciated. Let us know what other topics you would like to have discussed. Share this post with your friends. Remember to always praise your child. 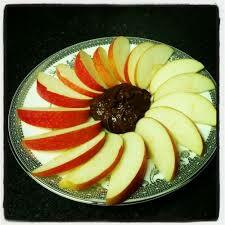 This is a delicious and healthy snack that is great for the kids after school or for a late night snack for parents. Get creative and use different nut butters and toppings. Have fun together and enjoy! Spread peanut butter on top of apples. Sprinkle toppings over the peanut butter. Leave us your comments. Your feedback is greatly appreciated. Let us know what other topics you would like to have discussed. Share this post with your family and friends. Keep praising your child.